This old-fashioned looking tag came about because of a special gift I received from my friend Robin at Cracker Jack Stampers the other night. Robin made us all beautiful gift tags and adorable little wrapped packages of chocolate – love chocolate! The gift inspired me to create hand-made tags to add to the home-made peanut brittle I make and give each Christmas. The peanut brittle has become a cooking tradition for me and something I really enjoy making and giving. So using some basic stamping supplies and a stack of manila shipping tags I set out to create a collection of individually-designed tags. I also proceeded to make one giant mess! It’s just the way I work, but I had such a good time. It’s so relaxing just to take the time to sit and play and see what materializes. 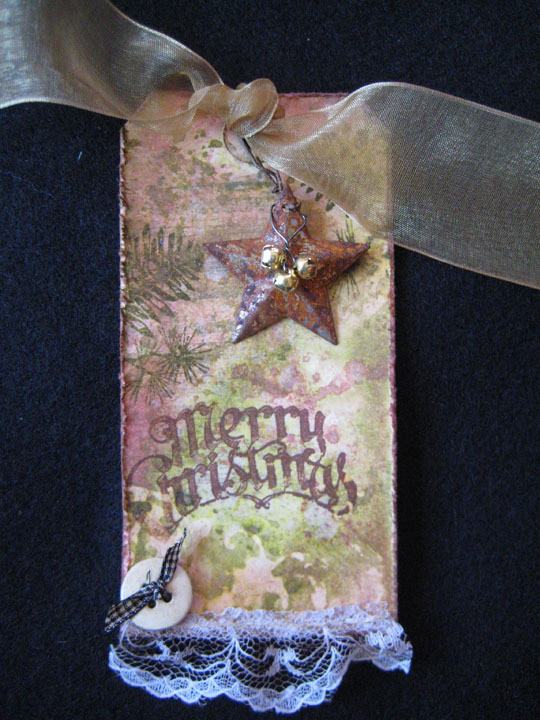 The supplies were minimal: Tim Holtz Distress Inks, Perfect Pearls in a mini mister, some holiday stamps (a combination of Tim Holtz and Wendy Vecchi from Stamper’s Anonymous), pretty ribbons and some steel-rule dies, my Vagabond and some little embellishments. I started with tags I had stamped recently using the milk-resist technique. I really like the way the milk-resist leaves mottled designs in the background. My style is more prone to earthy, old-fashioned, classic Christmas style so the tags are kept pretty basic with minimal embellishments. 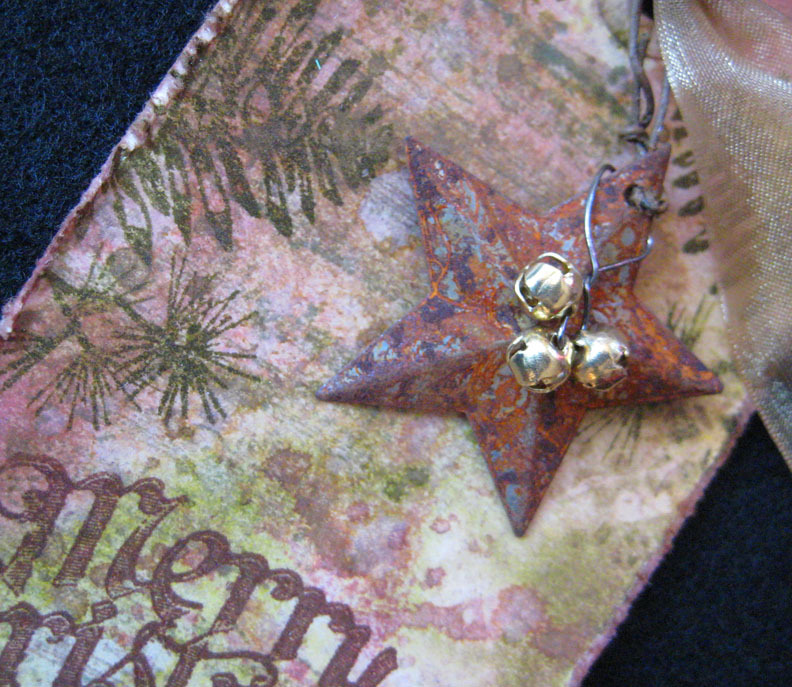 I swiped two colors of Distress Inks side-by-side on a non-stick craft sheet and spritzed them with water and Heirloom Gold Perfect Pearls mixed in a mini mister, dragged the tag through the concoction then dried it with a heat tool. I dipped and dried the tag several more times, flicked with water and heat dried. The pine boughs, music notes and sentiment were stamped on after the tag was dry. I then added the rusty star, lace trim and button threaded with a tiny gingham ribbon. It seemed a little plain so I wrapped the gold bells around the star and added the gold ribbon topper. It reminds me a little of a quaint, country Christmas. I just really love the mottled colors and hope the recipient will too! Yes, wonderful. Thanks for sharing. Hi Linda – what a great idea to use minimal supplies! Also wanted to share with you a great weekend scrappin’ place very close to home. I know you always go up to Sunset Shores, but my group just spent a wonderful weekend at Angie’s Inn on the Grand in downtown Howell. Place was clean and cozy, the food was totally delicious and Angie and her Mom Loretta were a couple of super hostesses! Check it out sometime if you want something local – I think you’ll be very pleased!! I hope to take one of your classes in Flint sometime soon – Bye, Cathy C.
Glad to hear you enjoyed your visit to Angie’s. Thanks ladies! Making these tags is becoming addicting – there are more!